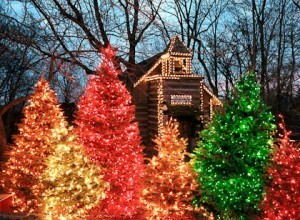 Silver Dollar City lights up for its "An Old Time Christmas" celebration. BRANSON, Mo., December 4, 2012 — “Wow, Branson listed along with destinations like New York City’s Rockefeller Center; Orlando’s Disney World, and Chicago’s Magnificent Mile Lights Festival as one of America’s best places for Christmas lights,” said Tammy Johnson, the Director of Operations for the Branson Tourism Center. “What a testimony as to the quality of the Christmas lighting displays people will experience in Branson as part of Ozark Mountain Christmas,” she continued. Silver Dollar City, Branson’s oldest and most popular paid attraction, is an 1880s-styled theme park that is transformed into a glowing Christmas spectacular with over four million sparkling lights throughout the park for its Old Time Christmas Festival. Its twice nightly 100,000 light Holiday Light Parade winds through a town square and by a five-story musical Special Effects Christmas Tree adorned with over one million sparkling lights. The Shepherd of the Hills Trail of Lights is a drive through light display located on the 160 acre Shepherd of the Hills Homestead. The unique two and a half miles has been integrated into the natural terrain of the “Trail that Nobody Knows How Old” made famous by Harold Bell Wright in his novel, “The Shepherd of the Hills,” and offers a Christmas wonderland unlike anything else anywhere in the world. The “Branson Area Festival of Lights,” is a one-mile drive display “illuminated with more than 175 displays” that “will delight children of all ages.” It is produced by North Pole Productions and is conveniently located just a few blocks from the heart of the Branson Strip. “And that’s just the major outdoor lighting displays and doesn’t consider the elaborate Christmas decorations at places such as ‘Branson Landing,’ ‘Big Cedar,’ ‘Chateau on the Lake’ and others as well as in theatres such as the ‘Andy Williams Moon River Theatre’ or the ‘Shoji Tabuchi Theatre,'” Johnson said. She also points out that that Christmas lights are not the only thing sparkling in Branson and that its live shows, attractions and shopping “sparkle,” day in and day out, with entertainment and excitement. For information on Branson’s lighting displays, shows, attractions, shopping or lodging call the Branson Tourism Center through their toll free number 1-800-785-1550. This entry was posted in Branson Attractions, Branson Events, Featured on December 4, 2012 by Gary Groman.